So, I guess Spring is here to stay and I couldn’t be happier! The new season equals long nights catching up with friends on a sunny city terrace, longer days (yes for shooting outfit pictures after 6pm :)) and of course a light and fresh wardrobe after an entire winter of wearing black and greys. And that’s exactly what I wore on these first sunny days! I paid a visit to the Patrizia Pepe store in Antwerp about a week ago and I was head over heels for the new spring/summer collection! Lots of aqua colours, pastels, romantic layers, metallic leather and bohemian inspired fringes set the tone this season. I browsed the lookbook and all the different themes look so good! I tried on a few looks and it was love at first sight for this leather biker perfecto in the softest rainbow tones. This cool jacket is made from the smoothest lamb leather and is finished with silver hardware and of course the iconic Patrizia Pepe fly logo on the zippers. Such a statement piece! Perfect to dress down with a t-shirt, ripped blue boyfriend jeans and some white sneakers or wear it more chique like I did in this look, with a matching voile skirt, silk white shirt , blush pink mary jane heels and soft blue bag. And can we please take a minute to discuss this fab skirt? The shorter front makes the shape super modern, yet feminine and glamorous. The aqua colours smoothly transition into one another and the georgette fabric flows up and down in a dramatical way with every light Spring breeze that comes along, just how I like it! The heels in a neutral shade make my legs look a bit longer without contrasting too much. 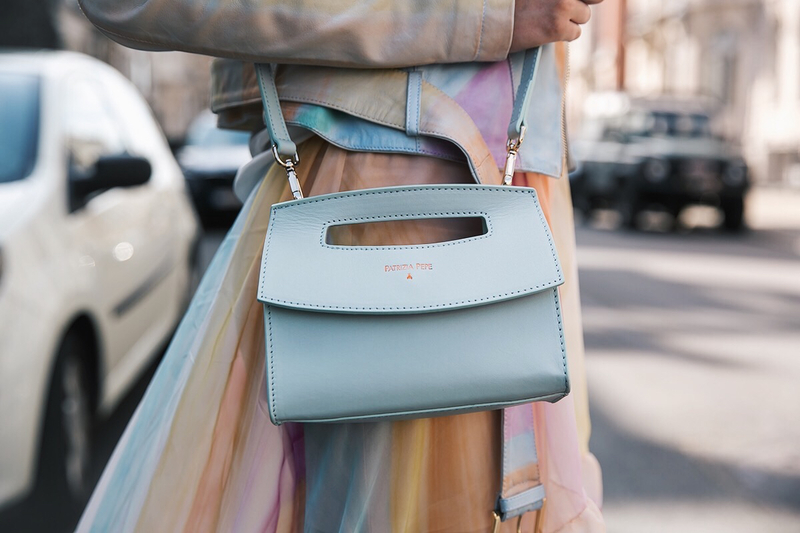 The leather bag in calfskin adds a playful touch to the look, whether you wear it as a clutch in the evening, or cross body with the long strap during the day. I’m sure I will get so much use out of these items in the months to come! Worn together, or of course combined in different styles and looks! It’s Monday again and I’m excited for quite a busy week with lots of fun projects and events on the agenda! Also my best friend who travelled the world in the last few months lands in Belgium later today so I can’t wait to see her again and find out all about her adventures and see all of her enviable travel pics! What are your plans for this new week? Waauw dit ziet er echt zoo awesome uit! 😀 Recht uit een sprookje! Echt zo’n prachtige outfit dit! Leve de lente!